RIO DE JANEIRO, Brazil --- Organizers for the 2016 Rio de Janeiro Olympics have added what they call a "bold flame" to offical images of the games' Olympic Torch. Officials pushed for a last-minute revamp of the image to show off Brazilian "innovation and spontaneity" just ahead of the Friday night opening ceremony. 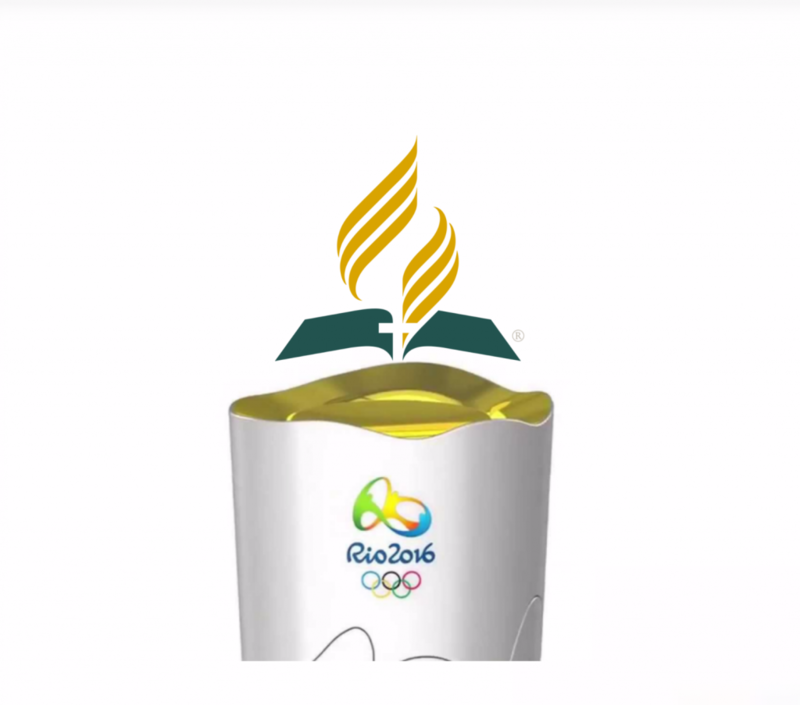 The flame image, part of the official logo of the Seventh-day Adventist Church, was borrowed with permission from the denomination's South American Division. An SAD spokesperson said that the Adventist Church was happy to authorize the use of its flame logo as it depicted "an important and urgent international message." He stressed however, that this did not give Adventists the right to watch the Opening Ceremony for the games after Friday sunset. SAD …. How appropriate for the Division’s acronym! Would be better adopted by the Brazilian Olympic Committee: SAD (polluted) water… SAD security teams… SAD housing for athletes (toilets, showers, and electricity now working)… SAD enforcement follow-through (or lack of) for doping enforcement… SAD mosquitoes (to bite you). And the SAD list could go on and on! Why doesn’t the GC try this torch thing at the 2020 GC Session? Good for PR. The run will start in Silver Spring, Maryland and end running down the streets of Indianapolis and climaxing inside the Dome. What a great way to endorse our health message. What a way to advertise the SDA church. SDA’s can carry the torch mile by mile. Teddy can carry the torch inside and up to the stage. What a great PR stunt. Can’t you see the headlines in the paper? Count me in at 2020 GC Session torch carrying detail. I am already practicing in my backyard and around the block. Forgot-Little Debbies to all who participate. Free advertising. Woe iz me! Come on, think bigger! Why not carry the torch throughout the entire lower 48, and touch on some Canadian provinces while they are close. This IS the NORTH AMERICAN division, right? Photo ops for Academies, colleges and Universities, hospitals, and churches around the United States. Good local interest stories. Maybe even make a movie similar to Forrest Gump! Give each participant a small box of carob chocolates. Now, how will this be good for Puerto Rico?